Realistically this decadent dessert should be enough for our family of four, but my husband disagrees. He eats the whole thing himself (umm thanks a lot?) Fortunately for him (!!) this takes only minutes to whip up a new ‘batch’. Cooked bananas seem to be a common dessert ingredient in Asian and South American countries and I can’t figure out why they haven’t caught on here. I remember the first time we ordered some sort of cooked banana dessert at a local Thai restaurant because everything else on the menu sounded unfamiliar and even less appealing. Wow, were we in for a surprise! We gulped them down and promptly ordered another plate! Give these a try ‘as is’ or omit the ice cream and chocolate sauce and serve over your favourite pancake recipe. They are delicious! Peel your bananas and slice them lengthwise. Heat your coconut oil in a pan over medium heat and add the bananas. Cook them for about 3 minutes and flip them over. Cook for about another 3 minutes until the bananas have softened. Melt your ‘Enjoy Life’ or other non dairy chocolate chips in the microwave for about 30 seconds. I add about a tsp of WARM water to thin. (Don’t add cold water or you will end up with a lumpy mess). Remove the pan with the bananas from the heat and add your maple syrup, tossing very gently to combine. Sprinkle with cinnamon. Serve onto individual plates and top with Coconut Bliss vanilla ice cream (or your favourite non dairy ice cream) and drizzle the whole thing with the melted chocolate. 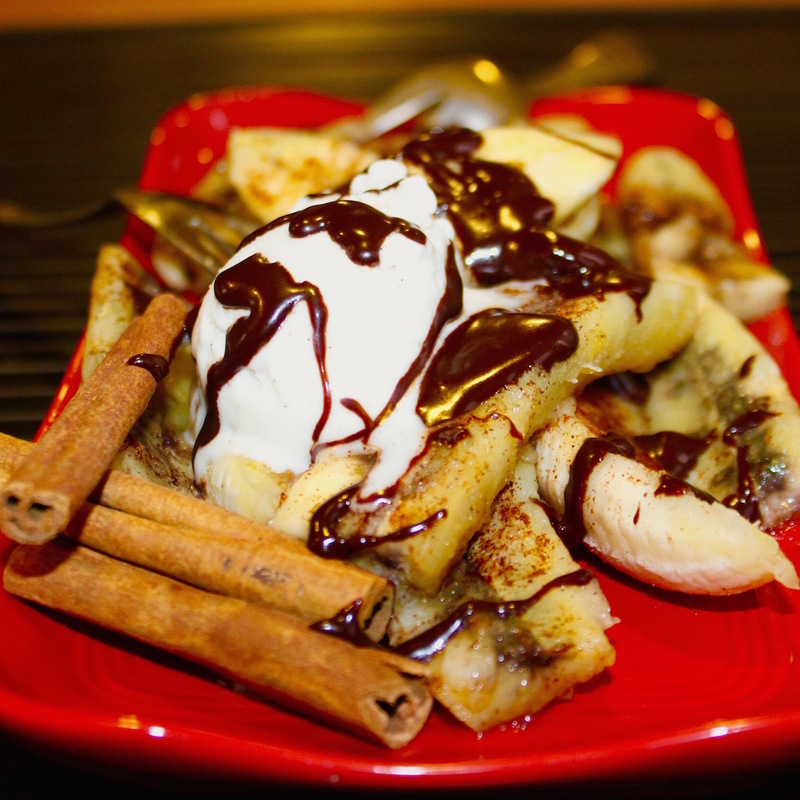 A delicious decadent dessert made with bananas, chocolate sauce and coconut ice cream. Adapted From: Roll, Rich & Piatt, Julie. "Abuela's Glazed Bananas". The Plantpower Way. Peel your bananas and slice them lengthwise. Heat your coconut oil in a pan over medium heat and add the bananas. Cook them for about 3 minutes and flip them over. Cook for about another 3 minutes until the bananas have softened. Melt your 'Enjoy Life' or other non dairy chocolate chips in the microwave for about 30 seconds. I add about a tsp of WARM water to thin. (Don't add cold or you will end up with a lumpy mess). Remove the pan from the heat and add your maple syrup, tossing very gently to combine. Serve onto individual plates and top with Coconut Bliss (or your favourite non dairy ice cream) vanilla ice cream and drizzle the whole thing with melted chocolate.